You have unearthed the pieces of an ancient Chinese map. 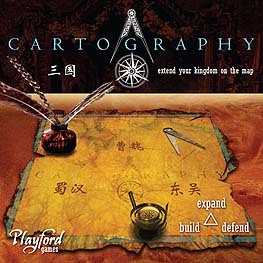 As you piece the map together you are drawn into the turbulent times of the Han dynasty and a land of mystical kingdoms. Take the role of the legendary warlords found in Luo Guanzhong's "Romance of the Three Kingdoms." Create lands to extend the map, build castles to claim land, and defend kingdoms from rival warlords in this simple yet elegant game for two to three players. Be on your guard! As you attempt to surround other players, they may be surrounding you.